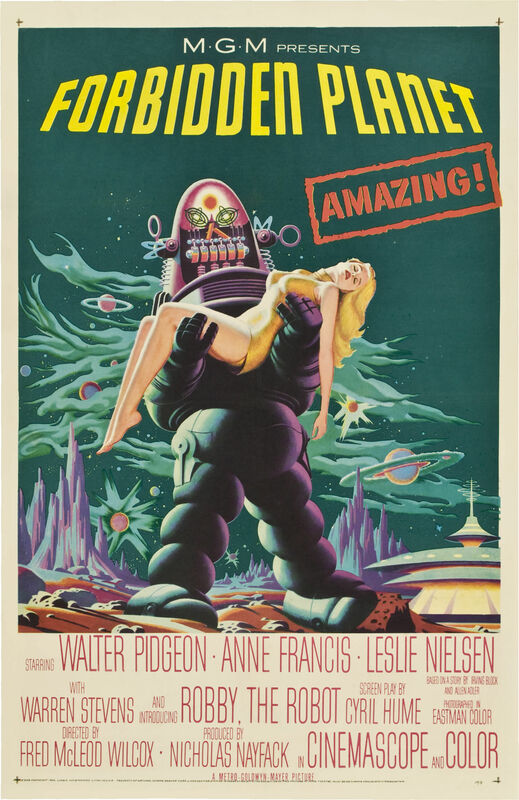 In the 23rd century, the crew leader (Leslie Nielsen) of an interplanetary cruiser is surprised to find that a scientist (Walter Pidgeon), his daughter (Anne Francis), and their robot Robby are the sole inhabitants on the planet Altair-IV. While falling in love with Francis, Nielsen learns that Pidgeon has tapped into the brain-boosting equipment left behind by the planet’s extinct Krell population, and has unwittingly created a monster of lethal proportions. Peary writes that while “several science fiction film of the fifties are more intelligent, clever, suspenseful, economical, original, [and] witty” than this “first SF film… made in glorious color and Cinemascope”, none was “more influential”, given that it was “the only SF movie of the period to succeed in giving the genre a long-denied tag of respectability within the industry”, and “represented the first time a major studio (MGM) released an SF film that was meant to be a top-of-the-line production”. He points out, however, that while the “picture certainly has an interesting, intelligent premise”, the script itself (by Cyril Hume) is “very trite [and] juvenile”, the “direction by Fred Wilcox lacks excitement, the acting is stiff, and the crew-cutted, always snickering, obedient, white, WASPish soldiers are more fitting for the dull Eisenhower Era than the 23rd century”. He further argues that the film’s worst mistake may be “having [the robot] Robby (who has amazing power) relegated to comic relief” rather than, for instance, joining in “during the climactic Id vs. Morbius scene”. While I’m annoyed by Robby — his interactions with a tippling cook (Earl Holliman) are especially groan-worthy — I actually believe the film’s worst error is its lack of (strong) female characters. Forbidden Planet immediately and unambiguously fails the Bechdel Test, given that there is only one female character (Francis) who is thus unable to talk to another female about anything, let alone a topic other than men. Indeed, nearly all of Francis’s dialogue centers ON men — from her growing understanding of what this “sexual attraction” thing is all about, to which man she will (inevitably) end up attached to, to how she can dress in a way that will make the men more comfortable, etc. She’s ultimately little more than skimpily dressed eye candy. Of minor interest is the fact that Forbidden Planet‘s storyline is loosely based on Shakespeare’s The Tempest — though we never fully understand why Morbius is so protective of his daughter, given that the “Freudian-incestuous elements are toned down.” Once the narrative centers on Nielsen’s exploration of Altair-IV and his growing understanding of Pidgeon’s history on the planet, however, we immediately become drawn in — thanks in large part to the truly “marvelous design of Altair-IV and the Krell underground chambers”, as well as some nifty special effects. Also wonderfully innovative is the “electronic music by Louis and Bebe Barron”. Regardless of its flaws, film fanatics will likely want to check this one out at least once, given its popularity and historical importance. Yes, for its cult and historical status. Take one part Shakespeare’s ‘The Tempest’, one part Jungian theory, and about 5 parts total ’50s sci-fi. Mix and stir. For years, the Rocky Horror Picture Show lyrics were reminding me that “Anne Francis stars in…’Forbidden Planet’…”. So I figured it was time to revisit it. And what a cool movie! One might expect it to be completely quaint now – and, at first, it does look like it will be simply that. But give it time. It has a wonderfully intelligent script. Walter Pidgeon is on-hand for a solid professorial leading role, Ms. Francis is charm personified, and Leslie Nielsen – even though you may keep expecting him to turn into Frank Drebin – is oddly authoritative as the commander. The root of the story is “the stored knowledge of the Krell” – which is simply amazing stuff. But apparently like all stuff that is not the pure stuff of God – even if it bears a remarkable similarity…it is, unfortunately, tainted (as is everything that is not, as we’re ultimately told, of God). Still, its possibilities are enough of a marvel to boggle the mind.